Founded in 1999, Uvaguilera is the long time project of Matiniano Palomero and Sebastian Cabrerizo. Uvaguilera is placed in an ideal environment for the production and aging of our wines in La Aguilera a small village close to Aranda de Duero. 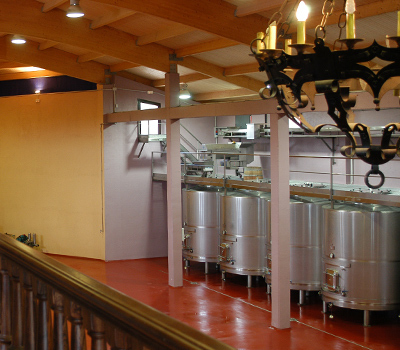 We have a capacity of production of 100,000 liters of wine in stainless steel tanks and approximately 300 French oak casks. Manjar de Silos is a dark type of wine with purplish reflections. Presenting the nose with agreeable aromas of fruits in harmony with its time of marinating in the casks. Once in the palate its great structure of perfect equilibrium can be appreciated amongst a degree of alcohol and acidity that makes it agreeable and very persistent. Palomero 2008 is concentrated, with intense color presenting in the nose a perfect balance between fruit and oak making it wide, complex and persistent while at the same time being smooth and elegant in the mouth. Tasting this potent, intense red wine, presents to the nose an equilibrium of abundant fruit aromas in balance with a subtle contribution of rich wood. Once in the palate its roundness, softness and elegance is persistent. Vegadero is a concentrated fruit presenting the nose with a perfect equilibrium of fruit and oak which can be tasted in the palate in amplitude.